The Art program at NRCA promotes creativity throughout Elementary, Middle School and High School. Students begin with the opportunity to learn about the Old Masters and then apply what they learn to their own masterpieces. Beginning in K-5, art class is a hands-on Art History program with slides, practice sheets, and then replications of the works of Masters like Van Gogh, Picasso, and Pollock. This program continues throughout the Elementary classes with each study presented at the level of difficulty appropriate to each grade. There are three art classes offered as electives in middle school – one 6th grade art class and two classes offered to 7th and 8th graders. 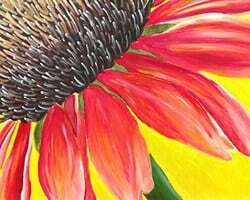 At this level, art students receive more specific instruction concerning the elements and principles of art and how these are present in effective artwork. Students in 7th and 8th grade art choose between either Drawing/Pen & Ink/Ceramics or Painting/Printing/Graphic Design. High School students are presented with a more advanced level of instruction in composition and design in High School Art I, with the further offering of advanced studies in Advanced Drawing, Pen & Ink, Ceramics/Sculpture, and Digital Photography. NRCA provides Advanced Placement Studio Art at the High School level for serious art students who are planning to continue their study of art in college. Students at this level of study prepare and present a portfolio of college-level assignments to the College Board for assessment and, depending on the grade received, students may be able to enter their college studies at a higher level than Beginning-101. This class offers students the opportunity to develop portfolios in Drawing, Two- Dimensional Design, and Three-Dimensional Design. In the past years, students in the AP Studio Art program have consistently received a score of at least 3 on the AP exam, and in more recent years, students have received a 4 or 5 on the AP Studio Art exam. The iPad provides many apps for the Art student to research, and study about techniques, processes, and become more familiar with famous artists and their work. These programs will expand the study of Art at NRCA using cutting edge technology, providing diligent and systematic research and needed to succeed as an artist. In 2007, the National Art Education Art Honor Society was established at NRCA. Students from various Visual Art classes, who achieve consistently high scores and are community minded individuals, are asked to join the Art Honor Society. The students honored as members, have college scholarship opportunities available to them for consistently high grades in Art. The Art program has exhibitions twice a year at NRCA. The Art Extravaganza is open to all students. The District ACSI Fine Arts Festival is for students who have been adjudicated in the Art Extravaganza, and received a Superior rating. Students also participate in several out of school competitions: the North Carolina State Fair Art and Photography Contest, the North Carolina State Senator artwork competition, the Southeast District of the Association of Christian Schools International, and the Jostens Photography contest. 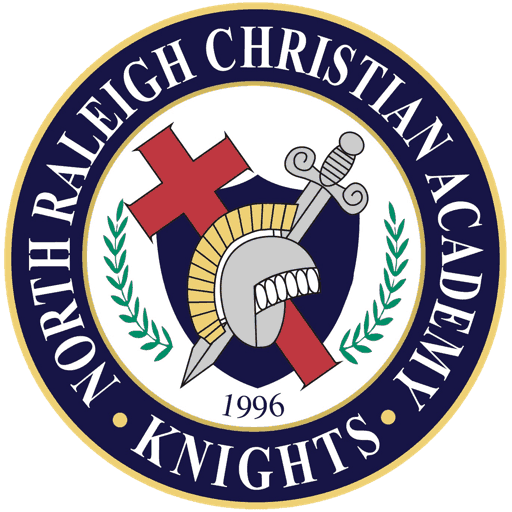 NRCA art students have regularly received Excellent and Superior ratings at competitions. NRCA hosts the ACSI Southeast District Art Festival annually. Over 300 students participate from 12 schools throughout the Southeast Region of North Carolina, Virginia, South Carolina, Tennessee, and Puerto Rico. NRCA’s Video Production department classes include Intro to Video in middle school, Broadcast Production and Honors Production & Film in high school. In our middle school Intro to Video class we give students an introduction to the role of the director, the basics of composition & an introduction to editing video with Final Cut Pro X. In high school our Broadcast Production class learns the basics of TV & video production, a more in-depth training on how to edit with Final Cut Pro X & how to apply everything they’ve learned in the production of a weekly school news show called The Knightly News. Our Honors Production & Film class is an advanced class dealing with a professional study of Final Cut Pro X as well as film appreciation. We are one of only a handful of high schools in the country to be an Apple Authorized Training Center for Education which affords our Honors Production & Film students the opportunity to achieve their Level 1 Apple Professional Certification in Final Cut Pro X! Our students are leaving NRCA with an industry leading professional certification that not only helps them as they apply for college, but could also land them great jobs right out of high school! NRCA’s graphic design class is designed for students who are interested in expressing themselves visually and digitally. In this class students learn about graphic design principles, creative and expressive typography, page layout, and digital image manipulation through the completion of both print and multimedia based assignments. 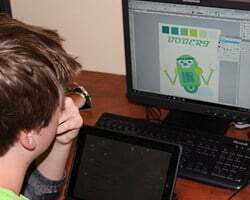 Students who take this class more than one year will have the opportunity to be involved in some of NRCA’s marketing projects where they will see their designs published. Even if a student is not planning to go into graphic design as a career, the things that they will learn will help in just about every field. Visual presentation is a part of every career in some way or another. 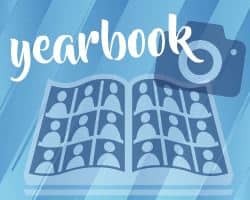 NRCA composes an award winning full-color yearbook, the Sabre. The Sabre features each grade, sports teams, fine arts groups and productions, the staff, and many of the special events that happen throughout the year. High school students are responsible for photography and editing, layout and design of pages, caption and copy-writing, and proofing. They learn valuable skills such as time management, organization skills, communication skills, budgeting and marketing skills, and basic publications law. Over 1,000 copies of the yearbook are printed each year, including one for every family represented at NRCA. We are proud to be recognized in the Jostens National Program of Excellence for the last three years!